Brocade prints aren’t just for the fall season, they’re perfect for spring too! These luxurious printed fabrics are making their way on jackets, trousers, blouses, shoes and more in pastel and bright summery hues, and you can expect to see more on the way. I personally love how these fabrics elicits a romantic and affluent touch, bringing out more of our elegant traits. Brocade Fabrics (from the Italian word for broccoli “brocatto”) are distinguished by a secondary, non-structural weft pattern which creates a raised appearance similar to embroidery. Brocades can be made from Silk, Cotton, Rayon, Polyester or metallic synthetic fibers. Brocades often have striking floral, geometric or or animal patterns woven into color-intensive backgrounds, sometimes with metallic highlights. While brocade might be one of the “it” fabrics this season—and pretty much year round, there are other fabrics that resemble them too—jacquard, tapestry, and damask. It can really get confusing. But The Dreamstress does a pretty good job explaining the difference. An array of designers featured brocade prints in their spring collections, one of my favorites this spring was Fenty x Puma Spring 2017 collection. Rihanna made a bold statement and featured soft and vibrant colored brocade on jumpsuits and bomber-style jackets, I want it all. There are so many retailers right now selling brocade, jacquard, tapestry, and its other sister fabrics in so many different styles it can get a little overwhelming. Here are a few items I’m loving right now. This Urban Outfitters kimono and cropped jacket. 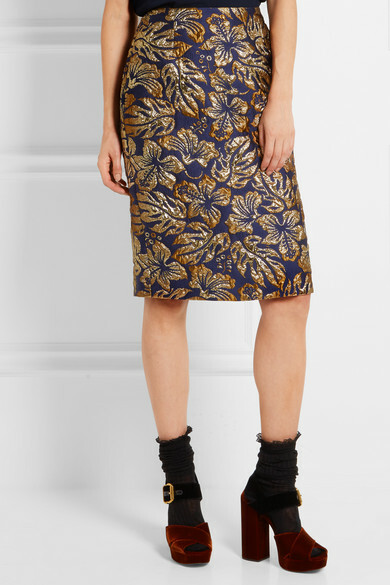 This H&M’s jacquard floral printed skirt (in both lengths), and this two-piece set. And last but definitely not least, this Prada skirt is just pure goodness. When it comes to styling, I’ll go against the grain and style this skirt with a white basic tee and a pair of bright neon yellow pumps—perfect for spring and summer. Do you own anything in these fabrics? Can you tell the sister fabrics apart? Leave a comment below and let’s talk. Tags: brocade fabrics, sewing, the difference between jacquard and brocade. Bookmark the permalink.